Established in 2004 , Body Cycles Australia Pty Ltd is a locally owned and operated tricycle company that cares about helping you achieve the freedom, independence and support you need. As a three-generation family owned and operated business currently run by a husband and wife team, we provide unrivalled friendly service and attention for all our customers. In conjunction with Bernie Jones Cycles, our trusted team has been expertly manufacturing trikes since 1989 . With our extensive years of experience leading the industry in special needs tricycles, Standard and therapeutic tricycle – trikes are designed. we will give you the edge you need to succeed. 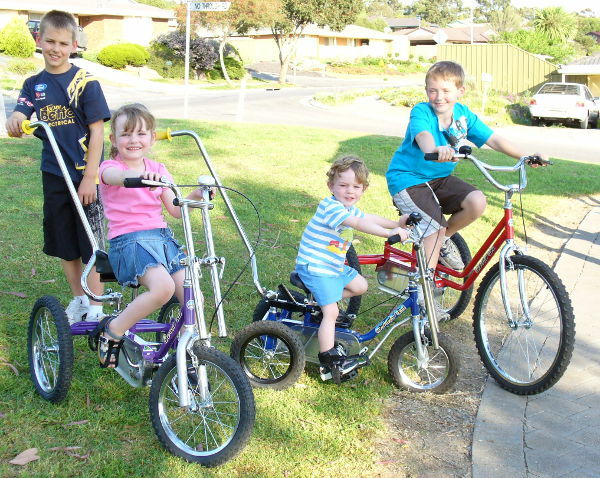 All our trikes are made in Australia from quality new parts and are never mass-produced. As we have been manufacturing tricycles for 25 years, we know what works and what doesn’t work for our valued customers. This is why we have made numerous modifications over the years to suit your individual preferences, giving you the perfect trike you deserve. Our superior selection of standard and therapeutic trikes is designed to assist children and adults with or without special needs to achieve the freedom and support they deserve. For an extensive range of made-to-measure top quality tricycles, no one does a better job than the team at Body Cycles. Our products are sold Australia-wide so there’s no reason to delay! call Body Cycles Australia Pty Ltd on 08 8377 0399 today for a free quote.